Making soup is easier than you think and my corn chowder will make a delicious addition to your home menu. It's easy to change the recipe up following my guidelines to create your favorite cream soup. 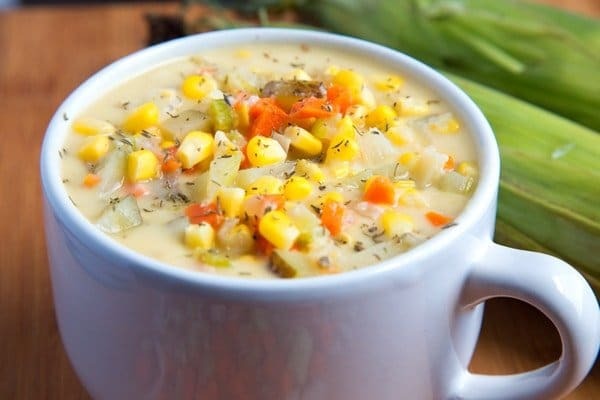 With the cold weather upon us, its time to start thinking about adding soups to our home menus and my Corn Chowder recipe is a delicious way to get started! 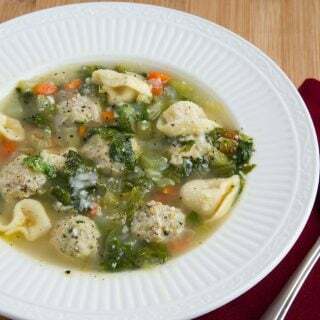 Whether you serve them up as a main course or a starter, making delicious soups for your family and friends is easier than you think with soup tips and tricks that I’ve learned throughout my culinary career. Part of the problem is always the time it takes to prep your ingredients and a lot of that has to do with y our knife skills. In this weeks show I gave some pointers on how to use your knife more effectively when cutting vegetables as well as some tips that will help you in your prep work. Just watch the video at the bottom of the page and you’ll see what I mean. 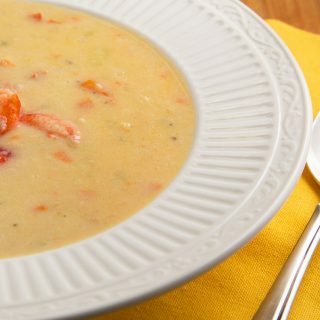 Soups like this Corn Chowder are easy to make and are fresh and full of flavor, unlike the soups you get out of a can where everything tastes the same. Once you see how easy they are to make and how many different types of soup you can make they’ll be no going back to the canned variety. 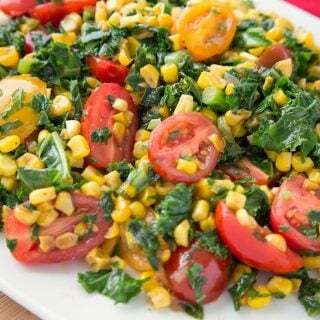 Remember to use fresh or frozen vegetables and other ingredients that you enjoy. Grains, pasta and beans help you keep the variety in your soup making as well as using any leftovers you may have in the fridge. Originally soup was made up of anything extra we had lying around, so don’t be afraid to get creative with your leftovers! 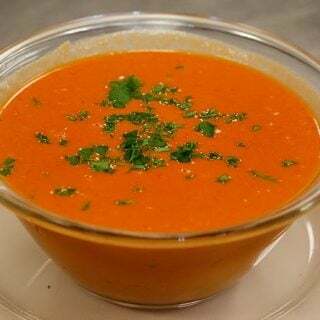 Check out my video to see how I go about creating soups. And if you enjoyed this recipe you might also like my Cream of Broccoli soup recipe. Add in the flour and mix well, turn down heat to low and allow to simmer for 5-7 minutes to let the flour cook. Add hot stock to roux (butter and flour mixture) and mix in well. add the milk and corn, reduce heat and allow to simmer for 30-45 minutes. 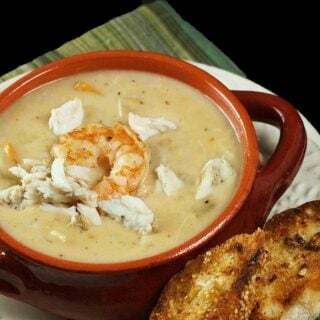 If the chowder appears to thick, thin it out with additional milk, stock or water. I made this soup just today. It was great!!!! It was thick and flavorful!! No bones needed for this one!!! I won’t think twice about making this again. I look forward to trying all the rest of your recipes!!! Chef Dennis, I enjoyed your knife skills and soup making wisdom. Only one request, please put the base of the microphone on several folded terry towels as every time you moved or touched anything near your work surface it created a disconcerting noise that detracted from your presentation. Otherwise 5 stars~! Thanks Bill, that was an ongoing problem. And I did add a towel under the mic. Is 1cup of flour correct? Best tasting corn chowder ever. I Will definitely make it again! Thank you Christina! I do love a good corn chowder! You gotta have a bone in soup if its gonna taste good! How about throwing in some chicken wings or necks or even a leg….just for the flavor. Bones, bones, bones. 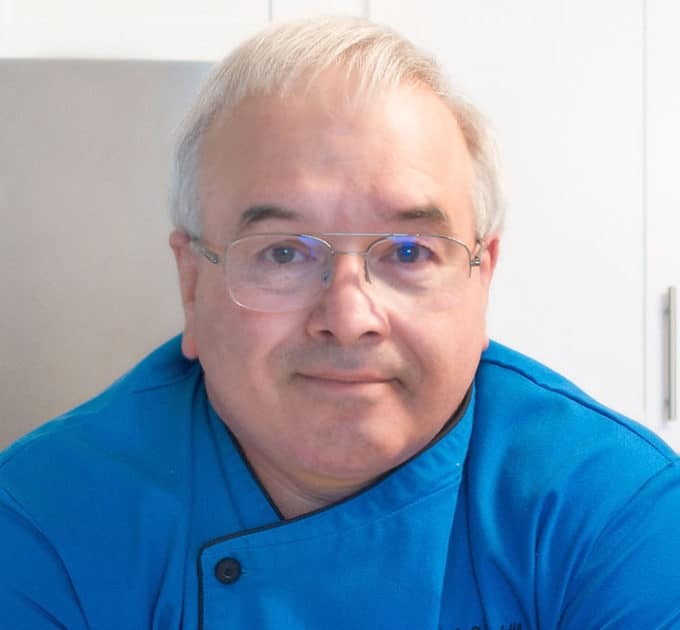 Chef Dennis, I Love! !, Love! !, Love!!! your website. Thank You for sharing what you know with others. I would love to have a Potatoes Soup Recipe posted. I am the only one in the family that will eat it, so do you have advice of how to make it and freeze for later. This will be a great dish for me when it gets cold. Thank you again and God Bless!!!! 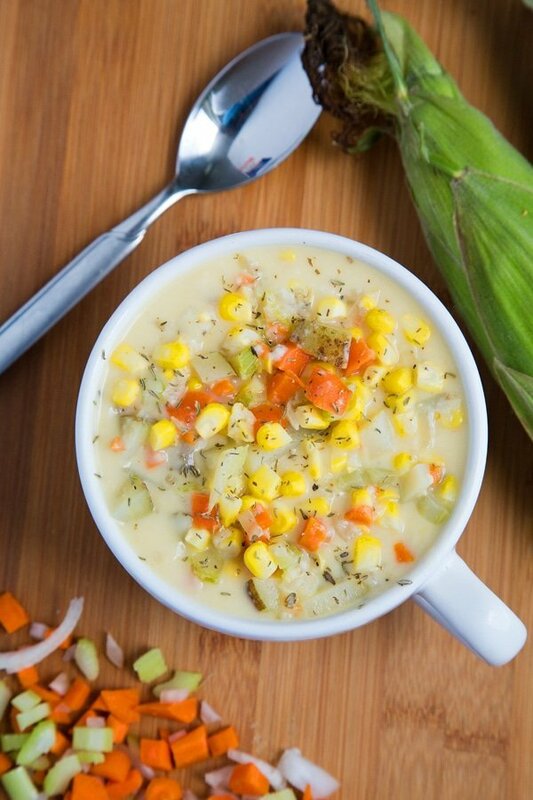 ‘Tis true that as we all start to bundle up in sweaters, we will all need to start setting out the soup du jour =) Thank you for sharing this incredibly delicious looking and sounding corn chowder recipe, Chef! you’re very welcome Kim, thanks for stopping by ! This sounds delish! I love crock pot soups so I can dump in ingredients in the morning and come home to dinner ready to go. Do you have suggestions for converting this to a crock pot recipe? I’m afraid I don’t have a lot of experience with crockpot cooking, the only tricky part could be the thickening of the soup. Dennis: You just have to write down what you are doing as you are doing it. I always keep a pad on the fridge and a pen handy. Most times I remember to write down what I’m doing. Your soup looks absolutely delicious, Chef! I don’t make many soups but yours looks delicious. Pinned. Thanks AnnaMaria, Lisa and I really enjoyed the fresh flavors! Dennis: This looks so good my friend! My soups have always had leftover meat and vegetables added to them. When my husband was alive and the kids at home, it seemed to be a never ending pot of soup. Every day a different taste. Thanks Charlie. I think the only problem with making soup from leftovers is recreating them!